Finding accommodation in Auckland, and near to AUT, can be difficult if you don’t already live here. The contacts and resources on this page may help you find accommodation near the campus you will be studying at. AUT has not inspected or endorsed the accommodation options described on this page. You must contact the provider directly for details or more information. The type of accommodation you choose might depend on your budget and how long you want to stay. Any accommodation providers listed below are not inspected or endorsed by AUT and you must contact them directly. Long-term accommodation for either a semester or a full academic year is more cost effective while living in Auckland. Expect to pay a bond (typically two-four weeks of rent), and also one week's rent (or more) in advance. The bond is returned to you at the end of your stay as long as the property is in a clean and tidy condition. Short-term accommodation may be a good option if you are new to Auckland and want somewhere to stay while you settle in and look for longer-term accommodation. Living in a homestay can be a great way to experience New Zealand culture. You live with a family in their home, so you can expect to take part in Kiwi life and improve your English. International students under 18 must live in a homestay if they will not be living with their parents or a designated caregiver. If you want to live on your own, or you need accommodation for a family, renting a private apartment or house may be a good choice. Most rentals in central Auckland are very expensive. Suburbs are a bit cheaper but you will need to think about the extra cost (and time) to travel to your campus each day. TradeMe is a useful website to find rental accommodation. Sharing a flat or house with other people – ‘flatting’ – is a good option if you’ve completed your first year or want to live independently. Before you go flatting, think about the kind of flat you want and what you can afford. Costs for things like food, electricity, internet and other bills – how will you share them? There are lots of websites that can give you information around how to choose a flat, what you need to consider, your legal rights and responsibilities, and how to budget. Some are listed below. You'll need to plan for things like food, transport and entertainment on top of your accommodation costs. Check the Sorted website to find sample budgets and living costs, a budgeting tool and other resources to help you plan. 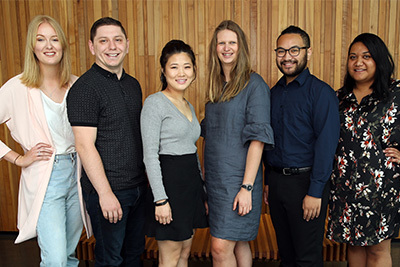 The Flattie website was built by AUT students to help students like you. 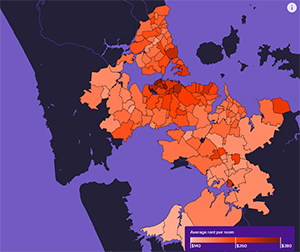 It's an interactive map that shows average costs, by suburb, of renting a room in Auckland. It also links you to TradeMe to find current rental listings.